Business Studies Certificate for Healthcare Professionals - Gateway to Canada | Canada Immigration Consultancy! Are you a Registered Nurse, Medical Technologist or any Health Professional planning to Study in Canada, gain a Canadian work experience and eventually apply for Permanent Residence in Canada? 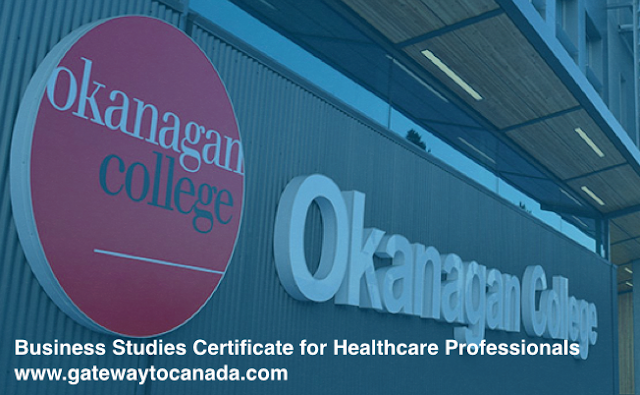 Taking this Business Studies Certificate for Healthcare Professionals offered by Okanagan College is perfect for you. The Business Studies Certificate for Healthcare Professionals consists of six courses in Business Administration for graduates of Health and Social Development certificate and/or diploma programs. It is designed to provide basic business administration skills to supplement qualifications to Certified Dental Assisting, Early Childhood Education, Home Support/Resident Care Attendant, Human Service Work; Practical Nursing or Therapist Assistant, or equivalent, for application in the various health and social development fields. It is a 1 year program. UPDATE May 6, 2017: This is NOT a 1 year program. It only takes around 7 months and thus, not eligible for a Post Graduate Work Permit. Canadian Immigration Consultancy is an Authorized Education Agent of Okanagan College. Okanagan College is a public post secondary institution located at Kelowna, British Columbia.